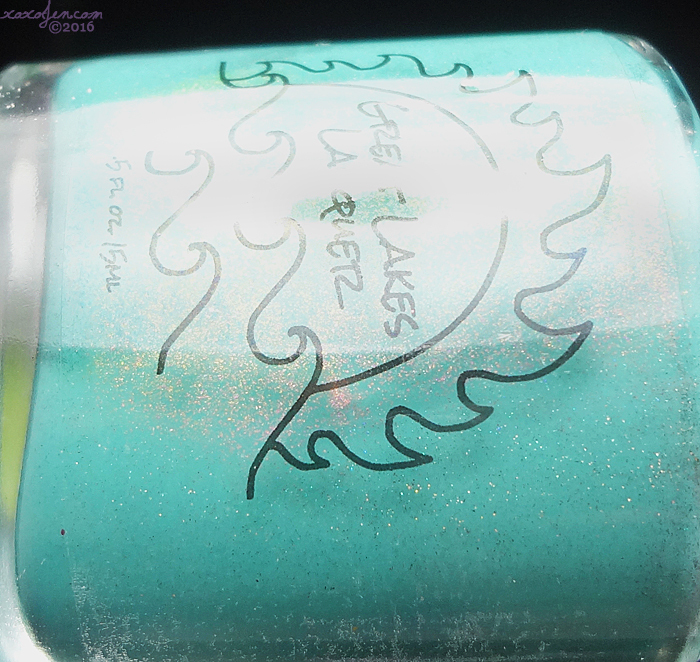 I am excited to have the opportunity to review Great Lakes Lacquers (GLL). The five polishes in my review are April LEs and are my first to try. Color me impressed. The packaging is cute and unique, the formula is good consistency and easy to control on the nail - most are opaque in two coats unless otherwise noted. The set launches April 1st at 2 PM CDT and they will retire on the 2nd of May at 6 PM CDT. Inspired by the ice caves that form when Lake Michigan freezes up by Traverse City. Add some light from sunrise or sunset and you get magic. 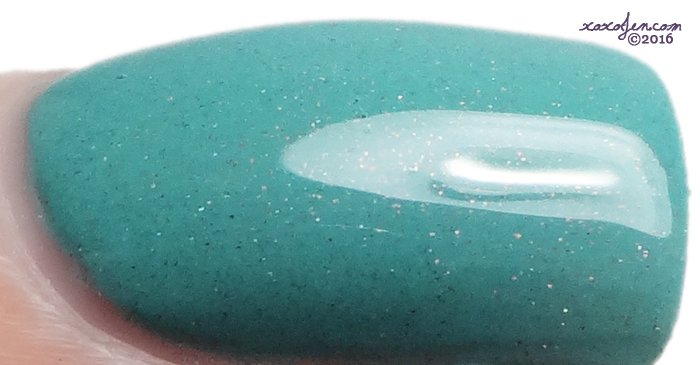 A medium blue green with shimmer that shifts from red to gold to green. I wore 2 coats for an opaque look. In person, the shimmer is visible on the nail too, just not on camera as well. A nod toward the tradition of April Fools! A topper that can also be worn alone, this is filled with gold holo microglitter, pale pink holo microglitter, peach microflake, and rosy microflake. One easy coat as a topper over your favorite spring color or 4 (as shown in my photos) for a mostly opaque look. I especially love it over The Ice is on Fire and have included those swatches as well. Another nod to April Fools. Winter likes to trick you into thinking that it's gone when it's not. This year it spared us all the way up til the end. Then walloped us before it left. 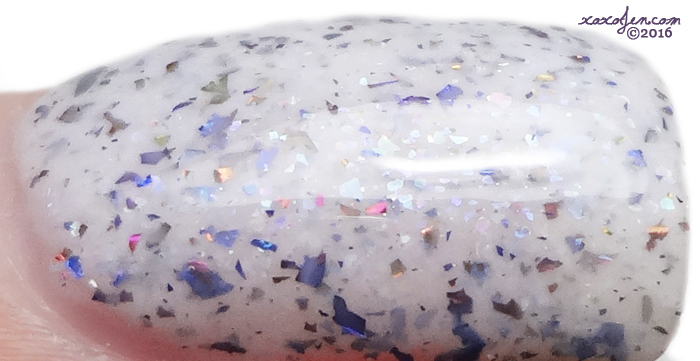 A white crelly with several types of microflake and two types of multichrome flake. I wore 2 coats for an opaque look - and this did not streak at all! From Mariah - "I love Hyacinths. Absolutely love. Next to lilacs, they are my favorite spring flower. They do not last nearly long enough for me. So I get a bit frustrated when those that are planted next to my porch are constantly stepped on. This year, I plan on moving them." A medium blue based purple with two different kinds of multichrome flake. I wore 2 coats for opacity. From Mariah - "My absolutely favorite flower ever. This spring bloom always just means home to me. I have a small bush in my front yard and it was the clencher in actually buying the house in the first place." 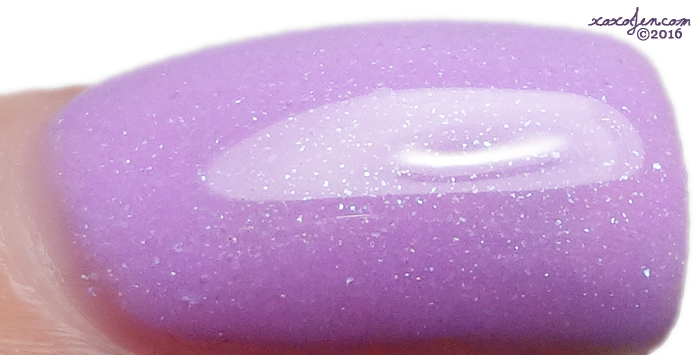 A light pinkish purple with aqua shimmer and a scattered holo affect. I wore two coats for the photos below. I love how versatile this polish can be, one coat gives a delicate fresh look while allowing a peek at your nail line. I like this look, especially in spring/summer seasons. 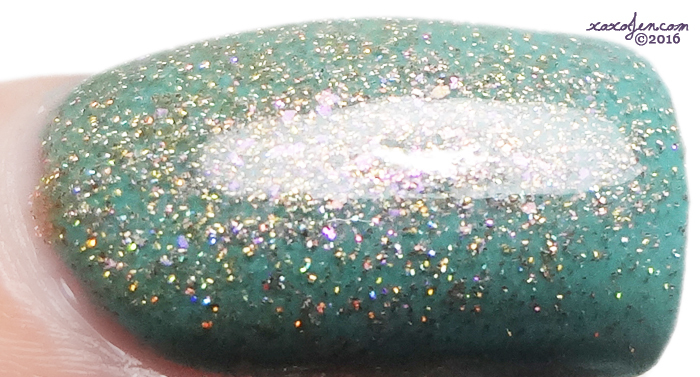 It might also make for a nice glitter or stamping sandwich when done in thin coats. Mmmmm...flakies...shimmer...holo! These have it all! I feel like these may be my first from Great Lakes!! Right?! This collection has it all! Some gorgeous colors in this April Limited Editions! Yup...I'm gonna need that white! Oh that darn shy shimmer! It's such a pretty polish, and I really love Fools Gold too! Those two are great together! Jen! <3 This was a long time coming considering you are one of the ones that got me into indie nail polish when it first started all that time ago. Thanks so much! Absolutely! Those were the days, eh? Wow thank you! :D You've made my day with your comment. Out Like A Lion is gorgeous! I love absolutely every one of these. The torture! Get them and it will no longer be torture! All so pretty, but I have a thing for lilacs!